A significant upcoming convening may lay the groundwork for something missing from the liberal Jewish community for the past twenty-five years: concerted action by funders and community leaders to engage more interfaith families in Jewish life and community. InterfaithFamily, in partnership with the Jewish Funders Network and the Jewish Federations of North America, is sponsoring the Interfaith Opportunity Summit: Embracing the New Jewish Reality, on Wednesday October 26, 2016 at the National Museum of American Jewish History in Philadelphia. The goal of the Summit is to explore – with funders, federations, leaders of Jewish organizations and interfaith family engagement practitioners – the issues that need to be addressed to have more interfaith families engage in Jewish life and community, and begin to build consensus for increased efforts towards that end. Jewish leaders have repeatedly expressed concern since high intermarriage rates were announced in the early 1990’s. In most fields – day schools, camps, teen engagement, Israel trips, social justice – funders and professionals have joined together to plan, support and execute major programmatic activities to strengthen organizations and expand recruitment. The field of engaging interfaith families, however, is different, distinguished by the lack of concerted action by funders and professionals. Individual organizations – notably the Reform movement, Big Tent Judaism, and InterfaithFamily – have developed and offered successful programmatic efforts, and generous foundations, federations and individuals have made those efforts possible with financial support. But there has never been concerted action like that in other fields, apart from a proposal for joint action by several foundations in 2008-2009 that failed because of losses dues to Madoff and the economic downturn. It is interesting to speculate on the reasons why arguably the single most important issue for the liberal Jewish community has not attracted concerted action. It may be that intermarriage is still viewed so negatively by so many that funders and professionals are discouraged from supporting any related efforts that are not designed to discourage or prevent it. Or, that there is simply too wide a chasm between those who wish to prevent or discourage intermarriage and those that seek to embrace and welcome interfaith couples and families – and therefore, no shared understanding of the way forward. Recent signs, however, indicate a growing shift in attitudes that could support significant concerted action to engage interfaith families – most notably, the award of the Genesis Prize to Michael Douglas in order to highlight the importance of welcoming intermarried families, followed by the Jewish Funders Network/Genesis Prize matching grant initiative to attract increased financial support for those welcoming efforts. In addition, there has been increased attention from organizations like Hillel, and the Union for Reform Judaism’s “Audacious Hospitality” work. numerous innovative organizations including Romemu, Lab/Shul, jewbelong, Tribe 12, Sixth & I, Central Synagogue, Rodeph Shalom, the JCC in Manhattan, Jewish Learning Ventures. Because of the importance of understanding the lived experiences of interfaith families, Summit participants will also hear from millennial children of intermarriage, young interfaith couples, and interfaith families with young children. The grantees of the JFN/Genesis Prize matching grant initiative, and other interfaith family engagement programs, have all been invited to participate and discuss their programs with interested attendees at tables over an extended lunchtime. The Summit will provide a rich discussion of the issues that need to be addressed to have more interfaith families engage in Jewish life and community. How can Jews and their partners from different faith traditions experience the value of Jewish wisdom, express their spirituality in Jewish settings, and feel included in “the Jewish people?” How can we effectively reach the spectrum of interfaith couples, from those who are seeking to those who are not, through messaging and marketing to interfaith families, and relationship building/community organizing approaches to them? What services and programs are effective entry points and ways to facilitate progress into more engagement, and what promising trends are emerging? How can we address difficult attitude and boundary issues surrounding intermarriage: privileging in-marriage, wedding officiation, ritual participation, and conversion? Can those who say they are “doing both” be included in Jewish life and communities? The concluding plenary will tie together the preceding sessions and address what a local Jewish community needs to offer to engage interfaith families, and the appropriate roles of general programs aimed at and marketed for everyone, and programs targeted at people in interfaith relationships. By bringing together funders and organization leaders – people in a position to make things happen – with practitioners in the field, we hope to build consensus on what increased efforts need to be taken to engage interfaith families and to facilitate the possibility of concerted large-scale action towards that goal. We hope that you’ll be there to join the conversation. 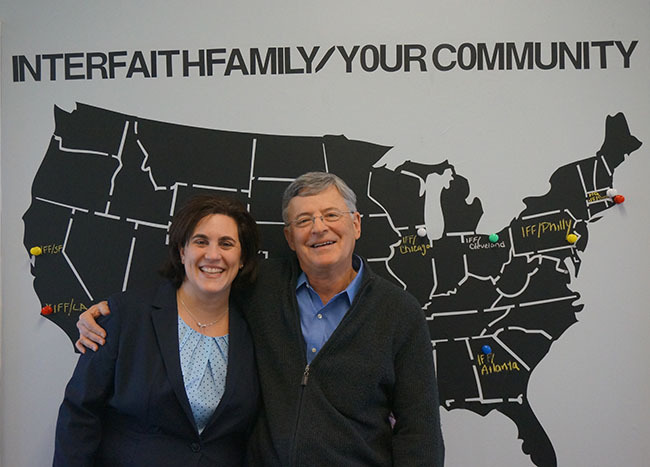 Jodi Bromberg is the CEO of InterfaithFamily. Ed Case, the founder of InterfaithFamily, is an independent writer, speaker and consultant. More information about the Interfaith Opportunity Summit program is available here, and registration is available here.